September 2008: The Good Luck Farm is undergoing demolition in preparation for construction of the Wal-Mart. Trees have been leveled and the farmhouse and outbuildings will be gone very soon. The 12-acre Good Luck Farm contains one of an ever-dwindling number of farmhouses with eighteenth-century origins in the area; it also includes several outbuildings on a historic landscape. 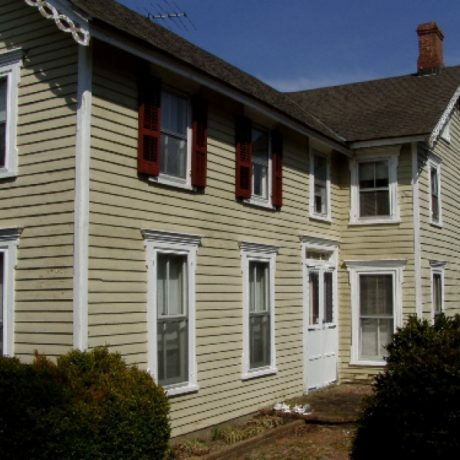 The 3-bay, gabled core of the house, probably built around 1760, likely received a 2-bay addition in 1800. An Italianate wing added around 1875, gave the house its “T” shape and current orientation. The house’s interior, despite small changes over the centuries, is unusually intact, especially the late nineteenth-century section. The threat to this property, which is inhabited and in good condition, is a proposed Wal-Mart that the Township Planning Board has approved. The plans for the development are currently under review by the State Department of Environmental Protection under the Coastal Area Facilities Review Act (CAFRA) program. Many local citizens oppose the Planning Board decision not only because this historic farmstead, which retains a remarkable level of integrity, should be saved, but also because a big box retailer in this location will be detrimental to other locally important properties and recreational resources. There appear to be several commercial properties nearby that could provide suitable alternatives. Preservation New Jersey urges DEP to call for an alternate site for Wal-Mart so this historic farmstead will continue to have “Good Luck” into the 21st century.